Founded by Master David Gladwell in July of 1985. 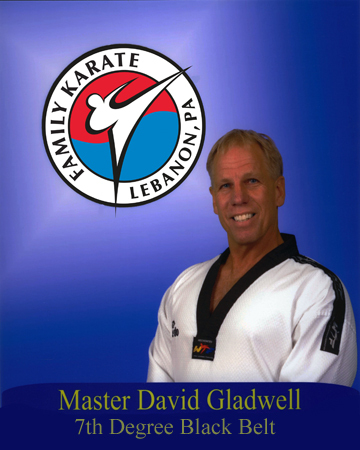 Master Gladwell has over 30 years instruction in Tae Kwon Do. He is a certified 7th Degree black belt through the Kukkiwon (Headquarters of the World Tae Kwon Do Federation in Seoul, South Korea). Master Gladwell participated in the First Kukkiwon Higher Degree Black Belt Testing ever held outside of South Korea, and received his Poomsae (forms) certification, also the prestigious Letter of Citation from the World Tae Kwon Do Federation. The National Association of Professional Martial Artist also assigned Master Gladwell certification in Cardio Kickboxing. Coaching member of USA Taekwondo 2006 to present. Master Gladwell has also been actively developing and implementing several specialized programs dealing with issues such as bully-proofing along with programs for kids with A.D.D. & A.D.H.D. These programs have been designed with the help of registered, practicing school teachers and Black Belt experts. His instructors teach these programs in area public schools as well as in his classes. A devout Christian, Master Gladwell is dedicated to empowering and enriching the lives of all people in our community, and has received numerous awards and recognition for his involvement and contribution to many local charitable events.